A Spread for a New Month! Posted on November 29, 2013 by J.J.
Hey everybody! Happy Leftovers Day! Hope you all had a great Thanksgiving if you’re American. Hope you all had a great…Thursday if you’re not. I’m posting my first spread. A few days ago, I realized that the upcoming month was going to be pretty big for me: I’m finally moving into my apartment; the non profit I work for is having its conference in January, so the majority of the prep is happening now; I’m starting a new job very soon. 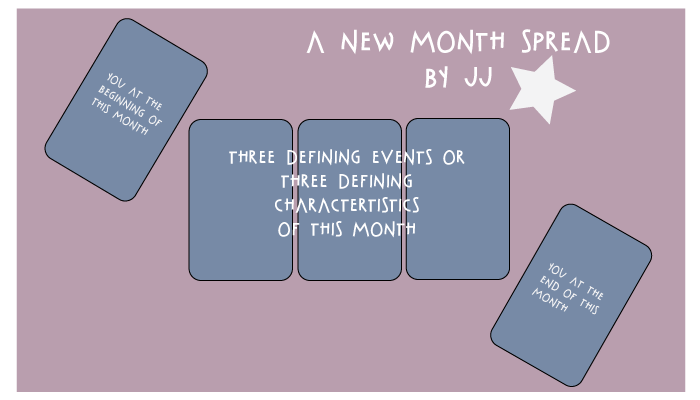 I decided I wanted a little guidance – a little outline so to say for this month. I used the Dreaming Way Tarot (which I just bought and love, love, love to death). Here are my results! Posted on November 17, 2013 by J.J.